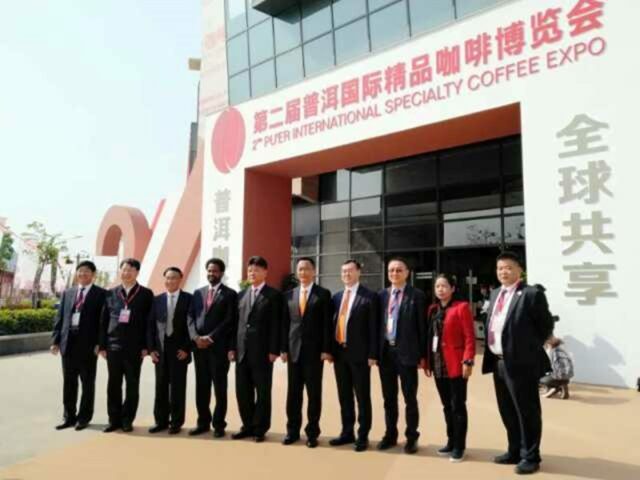 BEIJING, People’s Republic of China — A delegation from the Ethiopian Embassy in Beijing participated in the 2nd China International Specialty Coffee Expo, which took place last week from Tuesday to Sunday (March 12-17) in Pu’er City, considered the “Coffee Capital” of China. The Expo was co-hosted by the Industry Promotion Center of the Ministry of Commerce and Yunnan Province International Coffee Exchange (YICE). The aim was to foster commercial partnerships among stakeholders of the global coffee industry and the Expo brought together more than 1,000 participants from different corners of the world, including coffee industry experts, producers, roasters, café owners, baristas, importers, exporters, industry associations, and government officials. Ethiopia’s participation offered the Chinese coffee community the opportunity to explore its coffee exports and its value-adding processing. The delegation from the embassy shared the experience of Ethiopia’s organic, high quality varieties of coffee. Ethiopia, as the ancestral home of the highly desirable Arabica varieties of coffee, is well-positioned to penetrate the specialty coffee market in China. The Expo focused on the rapidly growing coffee market in China where there has been a recent tectonic shift towards a more upscale coffee drinking culture. China is rapidly becoming a member of the league of the largest coffee-consuming countries.